Just as we need to keep clean and look smart so do our pets. Even when travelling and staying in rented accommodation our pets should still look good and smell sweet. Dogs, more than any other pets can become quite smelly. Not only from unpleasant things they roll in but general doggy odour can become very unpleasant to live with. At home we can pop them into the bath and in minutes they are pleasant to live with but this can be much harder to achieve when travelling or on holiday. There are sprays and products on the market that can mask a pet odour but it is far better to attack the smell rather than attempt to cover it. A plastic plant spray bottle filled with no rinse shampoo can be used to dampen the pet’s coat and the liquid rubbed into the coat. Rub any excess moisture off with kitchen paper and brush the coat through to avoid tangles. 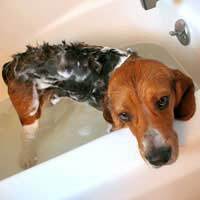 If a pet is allergic to liquid shampoos spray the smelly area with water and then take out the excess moisture with kitchen paper. The coat can be sprinkled with baby talc and then brushed out leaving the pet with a pleasant perfume in the coat. Potato flour, from any health food store is very absorbent and when a few drops of lavender oil are added to the flour and shook in a container provides a natural alternative to other chemical laden powders. Ensure any powder in the coat is thoroughly brushed out. Brushing the pet’s coat each day will take out any loose hairs that are likely to end up in the carpet or stuck onto soft furnishings. It will also stimulate the skin and help keep it clean. It is vital to keep the area the pet travels in clean and tidy. When travelling in the car cover the seats with a waterproof covering that can be taken out and washed if it becomes soiled. By adding several layers of old towels on the seat the top layer can be removed if it is wet or smelly. Keep a plastic sack in the car to hold all dirty bedding and when you reach your destination wash them ready for reuse. If you are staying in a rented cottage you may have access to a washing machine, check that once you have washed pet blankets the filter in the washing machine is cleared of any hairs and fluff. If staying in a hotel find a laundrette and wash the covers after carefully shaking off any debris. Disposable wet wipes are idea for the car as they can wipe any surface as well as the dog if his coat is dirtied. Take any opportunity to open all windows and doors to the vehicle to freshen the interior making sure that pets aren’t in the car and can escape when doing so. Where ever you are sleeping cover the bed with a sheet, this way if your pet should brush against the cover he will not leave behind any evidence of pet smells or hairs. This is also a good tip for sofas and armchairs in the sitting room of the cottage. A few sheets packed flat are easy to transport and save furnishing being stained from small accidents. Kitchen paper and a spray carpet cleaner can also be slipped into the car for use when muddy paws mark a carpet in the rental property. Some pet food can be extremely smelly. When staying in a hotel try not to feed the animal in the hotel room unless you are able to use the en suite bathroom and open a window. Try putting your pet onto a complete food whilst on holiday but change their diet gradually over several weeks or they could end up with a dodgy tummy. Alternatively feed the pet whilst out in the car when stopping to visit the beach or having a picnic. Travel bowls and food packed in plastic bags into a portion sizes can be fed with ease. Remember to carry drinking water for the pet as well. When leaving the holiday destination check every room for stray pet hairs or marks left by pets. By taking a little time to keep room’s odour free you and your pets will be welcome to visit another time.